...1984 Fiero~been garaged for 12 years. would like to sell must be picked up. will not transport. 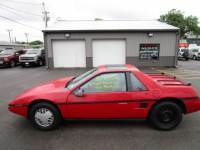 ...Red (Burgundy) 1987 Pontiac Fiero GT. Power windows and locks. Automatic V6.